Advanced engineering, custom quality, hand crafted, finest material, CSA certified. & Canadian Made, enough said?? Here’s a bit more that makes us above and beyond the competition. Our mission is to manufacture the best quality products that enhance your level of life. Saunacore products are engineered and manufactured in North America. We bring you the quality, durability, reliability, and safety that should be expected from a high quality product. We select our materials carefully, choosing suppliers that can provide Saunacore with quality, precision made, pre-tested and reliable parts that will endure the test of time. Wood is supplied from one of the finest Canadian Mills. Metal is chosen carefully, supplied by one of the largest and most prominent metal suppliers in the USA. All Saunacore products are assembled and tested before being shipped or taken out of our manufacturing facility. Our President takes pride in inspecting processes and products being manufactured on the plant floor daily. Time is taken to ensure all products have his final seal of approval before they are able to leave the building. This attention to detail and quality is what Saunacore products are all about, but it does not stop there. Our objective is to be one step ahead, to be leaders in our field, knowing that our products are achieving their purpose and are at the forefront of new technology and ideas. Whether it’s your first or fiftieth sauna session, we want to ensure that you are relaxed and that your body feels rejuvenated every time. Our infrared saunas are engineered to make you sweat, allowing your body to feel detoxified and refreshed, enhancing your quality of life. This notion drives us and we hope that this life change will reassure you that you have made the right choice. In summary, at Saunacore we go the extra mile, manually double and triple checking that everything is as it should be… it’s all about building it with heart. 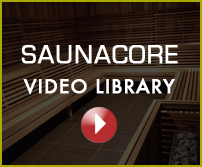 We believe Saunacore is one of the worlds leading sauna manufacturers, offering the best quality sauna and steam products in the world, backed by a globally prominent manufacturers warranty. We believe our quality and client focus is unsurpassed. Buy our products with confidence and enjoy.